Usually on Sunday, around 3 pm, we'll decide it's cocktail time. Last Sunday, SP decided to try a new cocktail, one called Gin Harvest. I don't care for gin, so he was on his own. I stuck with bourbon. He found the recipe in the latest issue of Costco Connection July 2017. 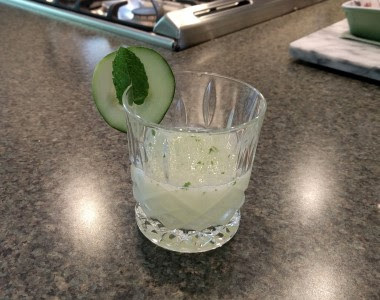 Gin, cucumber, lime, mint, simple syrup. He said it was refreshing and tasty. I might like this if we swapped the gin for vodka. Maybe next week I'll try that. 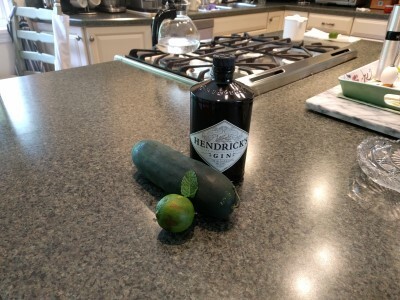 Add lime juice, simple syrup, 3 cucumber slices, and 3 mint leaves to a cocktail shaker. Muddle together. Add ice and gin. Shake. Strain into a glass. Garnish with remaining cucumber slice and remaining mint leaf.